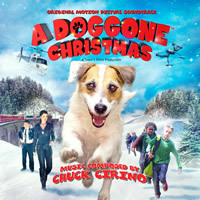 Dragon’s Domain Records, to be distributed through buysoundtrax.com presents the original motion picture soundtrack for A DOGGONE CHRISTMAS, featuring music composed by Chuck Cirino for the 2016 children’s adventure film directed by Jim Wynorski, written by J. Brad Wilke, Josh Holt and Jim Wynorski, starring Jaret Sacrey, Walker Mintz, Jayden Heddon, Jolie Ledford, Zachary Cirino, Steve Altman, Dominique Swain, Rib Hillis, Lauren Parkinson, Paul Logan, Amy Holt and Just Jesse The Jack as Murphy. A DOGGONE CHRISTMAS continues the longtime collaboration between filmmaker Jim Wynorski and composer Chuck Cirino, which includes films such as CHOPPING MALL, DEATHSTALKER II, NOT OF THIS EARTH, TRANSYLVANIA TWIST and RETURN OF SWAMP THING. A DOGGONE CHRISTMAS tells the story of Murphy, a charming pup with telepathic abilities who escapes from a government facility and runs straight into the loving arms of two young brothers. But the U.S. government won’t give up their secret weapon so easily and with a no-nonsense government agent hot on Murphy’s trail, the boys and their school buddies have to keep their new friend out of sight from the government helicopters and drones AND their parents, who have forbidden them from having a pet! Can this unexpected team of heroes, armed only with their wits, their bikes and a strong bond with Murphy channel the real spirit of Christmas to save the day? Chuck Cirino did not start his career as a composer, but rather as a programmer in Stroudsburg, Pennsylvania for a Public Access cable TV station, where he learned how to create TV shows by himself, without a crew. In his spare time, he experimented with the station’s video equipment and created a series of genre productions that allowed him the opportunity to learn how to incorporate special effects into his work. After relocating to California, Cirino transitioned into directing high-end special effects television commercials. His first work as composer was for the 1980 cult film GYPSY ANGELS, which starred Vanna White and Richard Roundtree. Since then he has scored films for Roger Corman, directed music videos for bands like Earth, Wind & Fire and The Dickies’ KILLER KLOWNS FROM OUTER SPACE, and has recorded over 40 music soundtracks for feature films including SORCERESS, RETURN OF THE SWAMP THING, HARD TO DIE, TRANSYLVANIA TWIST, and many others. Most recently, he has scored THE SEA BEAST, MEGACONDA, CRY OF THE WINGED SERPENT and CAMEL SPIDERS. In addition to composing the music for A DOGGONE CHRISTMAS, Chuck is also one of the film’s producers, the cinematographer and the visual effects designer! A DOGGONE CHRISTMAS from Dragon’s Domain Records, to be distributed through buysoundtrax.com is expected to begin shipping on the week of December 26, 2016 and can be ordered at www.buysoundtrax.com. A DOGGONE CHRISTMAS is a limited edition of 1000 units. As a special offer, the first 100 people to order the package from the record label’s website will have their copy autographed by the composer at no additional charge.